Gurnard’s Head is at the end of Cornwall with the next stop Newfoundland. Its beauty lies in the sense of a time past. Do not believe, though, that it is tiresome to reach. 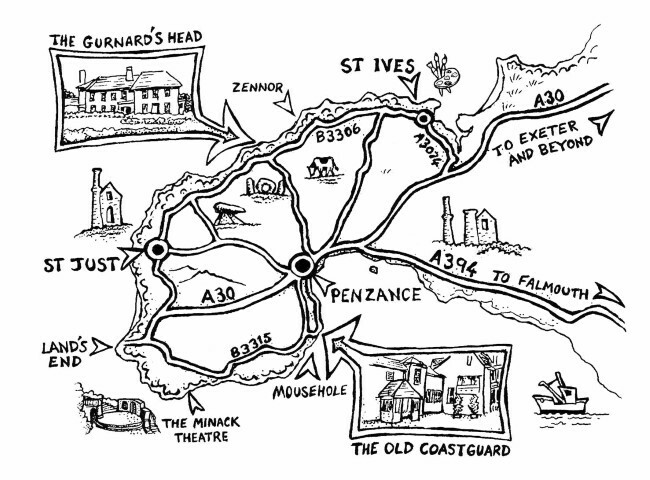 With the A30 now dual carriageway nearly all the way to Penzance, CAR journey times are now much shortened and we do not take much longer to reach than Padstow, Falmouth or Newquay. London - Gurnard’s Head has been done in 4 hours and 1 minute, but a good run will not take much more than 5 hours. We have plenty of parking space at The Gurnard’s Head. There are two westbound stationary speed cameras on the A30, both on downhill single carriageway stretches, one near Marazanvose and the other near Roseworthy. TRAINS from London (First Great Western) and Bristol/The Midlands (Virgin) are pacier than a John Grisham novel as far as Plymouth. But do be aware that the line from Plymouth is slow and winding, although undeniably pretty. If time is of the essence, or if you would like to explore, do hire a car at Plymouth or Exeter. If you prefer to FLY, Newquay now takes flights from many regional airports and we are but an hour’s drive in a hire car. Daytime services to Penzance or St. Erth are usually five hours from London Paddington or four hours from Bristol. Do book ahead for much better prices and consider the comfort of first class if the prices permit. It's worth it, as is the Pullman Dining Car which leaves London with the lunchtime and early evening trains. Our preference is to take the Night Riviera sleeper from London Paddington. If you let us know ahead you can join us for breakfast, on us, as a reward. For tickets, book here. 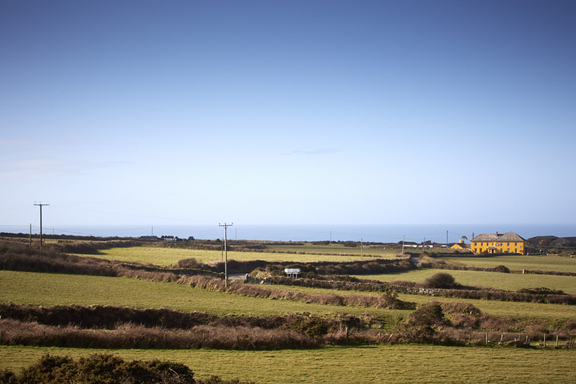 Although we don't like flying, Newquay Airport is less than one hour’s drive from us. The frequency of flights will of course be seasonal. Flybe flies from Leeds, Edinburgh and three daily flights from Gatwick. AirSouthWales flies from Bristol, Cork, Dublin, Gatwick, Manchester and Newcastle. In the style of Mr Toad? Take the M5 to Exeter and the A30 for Okehampton. Continue on the A30 all the way to Penzance. Once at the Tesco roundabout branch left, and then fairly immediately right under the A30 flyover to Gulval. After a half mile, take the (straight) left to Newmill and take the next right (also Newmill). Follow this road for 4 miles over the moor until you come to a T junction. We are immediately and unmissably ahead of you. When hiring a car from Newquay airport, be aware that hire companies may charge a fee for customers who land out of office hours.